Hi! 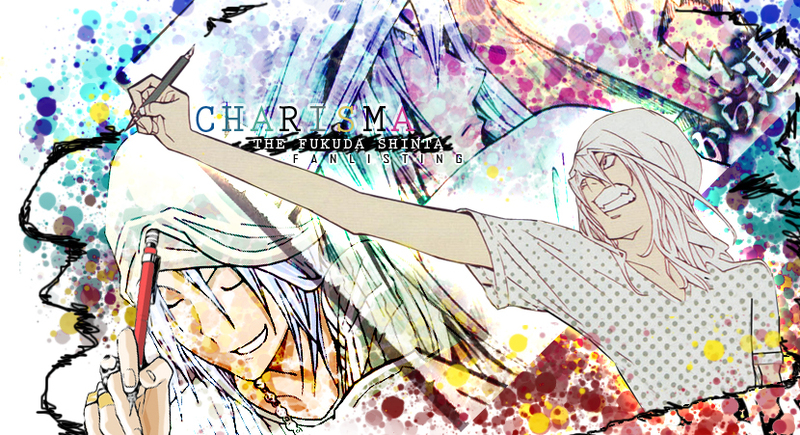 Welcome to "Charisma", the TAFL approved fanlisting for Fukuda Shinta , an amazing character from the series Bakuman, created and illustrated by the great Ohba Tsugumi and Obata Takeshi! Fukuda is my favourite character. He appears since the 22th chapter, when Saiko became Eiji's assistant. In a first moment he can seem just an aggressive and arrogant boy, but knowing him better we can find a very smart and charismatic person, and also an exceptional mangaka with an impressive talent. At the begin he works as an assistant for Eiji, because his manga hasn't a pubblication yet. That's the reason why at the begin he sees Saiko and the others are rivals, but thanks to them, with the development of the story he makes better not just his own drawing style, but his entire manga too! For this reason, his efforts are recompensed and he gets a serialization. Also... He understands that now he has friends! Many time his pride and his way to explain his thoughts without esitation stop him to use kindness with the others. Err... he doesn't even want to be considerated kind! But he's a very special friend with a golden heart. He's ready to risk his beloved carrier and himself to help a friend in every moment, and this determination of him is the side of him that I love the most!! Please, choose a link from the right to fully access the site, and if you're a fan of Fukuda, feel free to join his fandom! intend to violate them. Layout and contents are ©Dorothy. Do not reproduce without	permission.